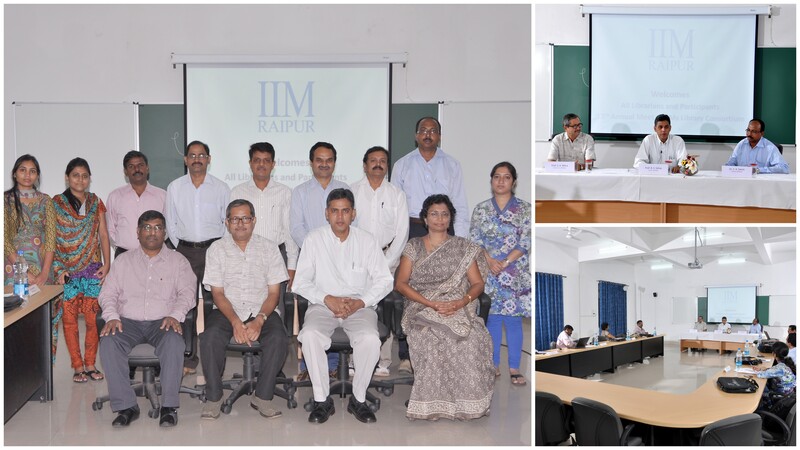 IIM Raipur organised 13th IIM Library Consortia Meeting during September 28-29, 2012. The meeting, which is held annually at different IIMs, aimed at strengthening the information system and knowledge infrastructure of the IIMs as well as streamlining the collection development policies of the libraries of all the IIMs in the country. The meeting started with a welcome note by Prof. S.K. Mitra, Chairman, Library Committee, IIM Raipur. A special note of welcome was extended by the Director, IIM Raipur, Prof. B. S. Sahay. In his welcome address he suggested that other than the professional duties and responsibilities, IIM Library Consortia members should jointly focus on core areas like training/workshops for librarians, developing negotiation skills and contributing effectively in the promotion of research. He added that such initiatives would ultimately enhance the research value of the user community. He also posited that the conceptualisation of library has also been changing as libraries are moving from being mere physical repositories of knowledge to digital form. This calls in for preparing the libraries for future use. He also suggested that all the IIMs should come together and organise a World Summit of Libraries which should have wider scope that invites all the 2600 plus management schools in the country. He assured the members of IIMs that necessary infrastructure and logistics would be provided by IIM Raipur for organising the Summit. The publishers/vendors participating in the meeting included ProQuest, Wiley, Taylor & Francis, Springer, Informatics, IndianJournals.com, GIST, EBSCO, SerialSolutions, Elsevier, Sage, Emerald, Total Library Solutions, Bharat Book Bureau, IGroup, Oxford University Press, Prime Database, Harvard Publishing, Swets, LexisNexis, Cambridge, Palgrave, Gale Cengage etc.